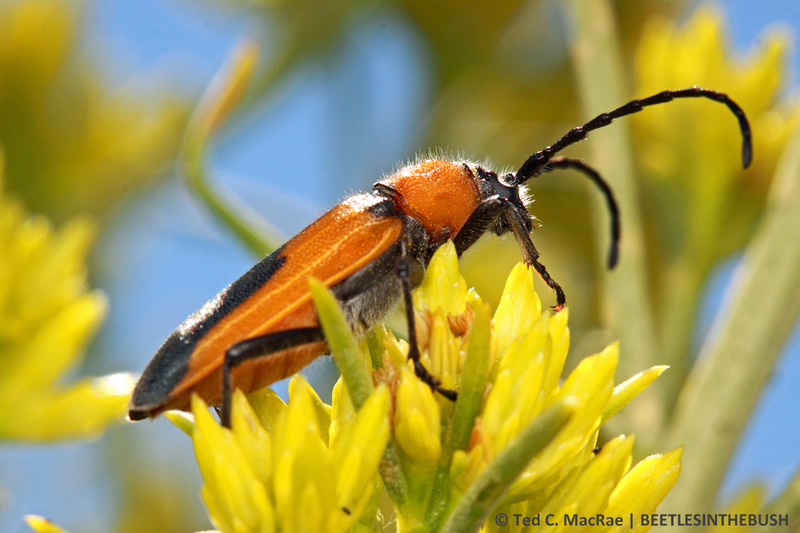 Males are solid, sublimely orange with strikingly contrasting black legs and antennae. Crossidius c. caeruleipennis is immediately distinguishable from C. c. temprans (and most of the other C. coralinus ssp. that we collected on the trip further north in Nevada and east in Utah and Colorado) by its bright orange rather than dark red coloration. 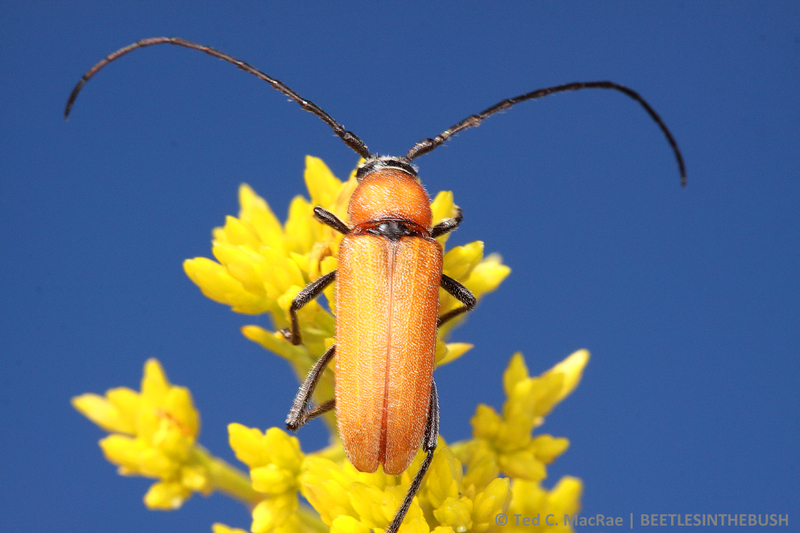 The subspecies is restricted to the Owens Valley of eastern California and greatly resembles another of the orange subspecies that we collected on the trip, C. c. monoensis. That subspecies is found just a short distance north in the Mono Basin, though at much higher elevations, and is easily distinguished from C. c. caeruleipennis by its smaller average size, by having the black markings of the elytra more expanded apically in females and at least present in males, and by the presence of black bands along the apical and basal margins of the pronotum (Linsley & Chemsak 1961). Females are distinguished by the apical blue-black marking on the elytra and their shorter antennae. As it turned out, the beetle was as abundant as any we had seen on the trip to that point. Not that it didn’t require some effort to collect them—they were still rather sparsely distributed among the plants and definitely showed preference for plants that were not as far past peak bloom. However, the habitat was extensive—we could have wandered freely for hours on end without looking at the same plant twice (although that did not stop me from re-checking a few plants that were in peak bloom and seemed to be especially favored). The males were simply gorgeous—a bright, creamy orange that sadly takes on a dull quality in preserved specimens and with long black legs and antennae. The females are no dogs either, less strikingly orange due to the blue-black apical markings on the elytra, but certainly more robust than the males in a subspecies that is already one of the larger of the species. Temperatures climbed rapidly at this relatively southern and lower elevation locality compared to most of the others that we visited during the trip, so the beetles became quite active very quickly after we began to see them. I had only a short window of time in which to attempt field photographs, and while I’m not completely satisfied with the ones that I show here, they were the best that I could manage and still get the blue sky background that I desire for “beetles on flowers” photographs. Gray rabbitbrush dominates the Owens Valley sage grassland where C. coralinus caeruleipennis occurs. I remember collecting this subspecies when I was a kid on a family camping trip along the Owens River. Not only is this beetle sublime, your photo with the blue sky background is just what we need on a gray, snowy, sleety day. Everybody should do a Crossidius trip. I can’t believe I collected cerambycids for +30 years before I took my first one. I pulled off my first true Crossidius hunt last September. The last find on the trip, coincidentally, was the subject of this post. 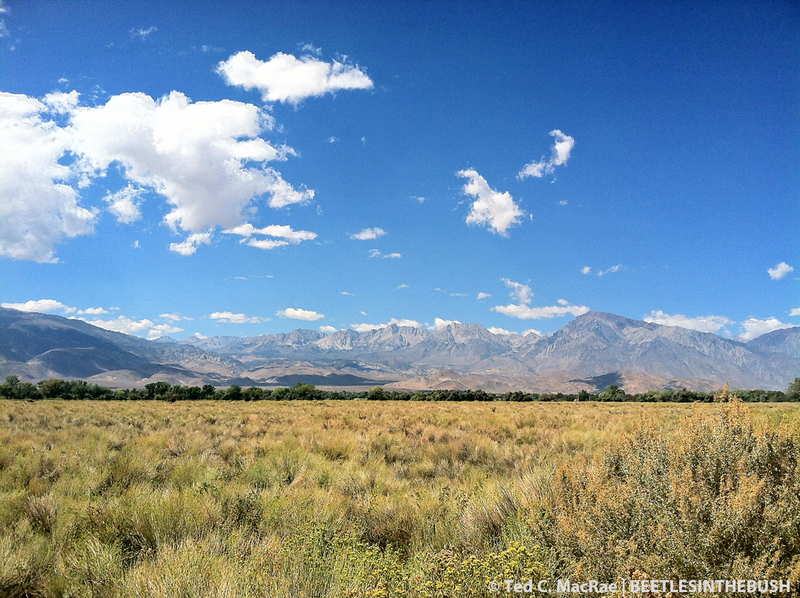 The day I drove up Hwy 395, there was a storm blowing over the mountains so it was extremely blustery along the highway. 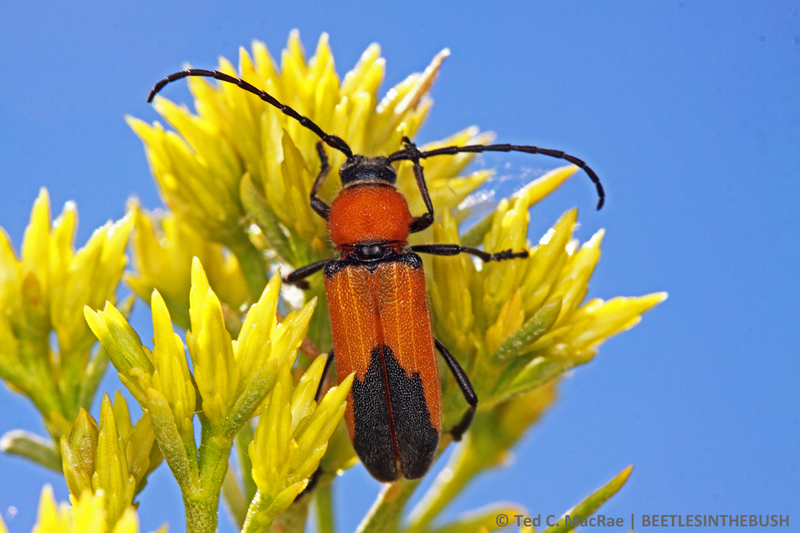 These guys were amazing in that they were still out on the rabbit brush, and seemingly unaffected by the wind. There were some Crossidius ater out that day, too, but only in more sheltered areas. Too bad we didn’t hook up—we were through the area at the end of August. Maybe next time!